Plastic bags are helping bury our earth in trash. I do have a stash of reusable bags in the back of my car to grocery shop with. But sometimes I forget to bring them with me when I shop. Now what? This bag was designed so I'd never have this problem again. 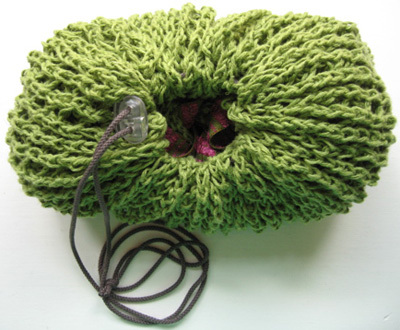 It's made of 100% hemp, so it won't mildew. The production of the yarn itself didn't add more chemicals into our environment, since industrial hemp requires no pesticides or fertilizers to flourish. It's worked in a solid garter stitch at the bottom, where all the stuff I buy will sit, with a little smooth lip around the base in case little things want to try to escape. 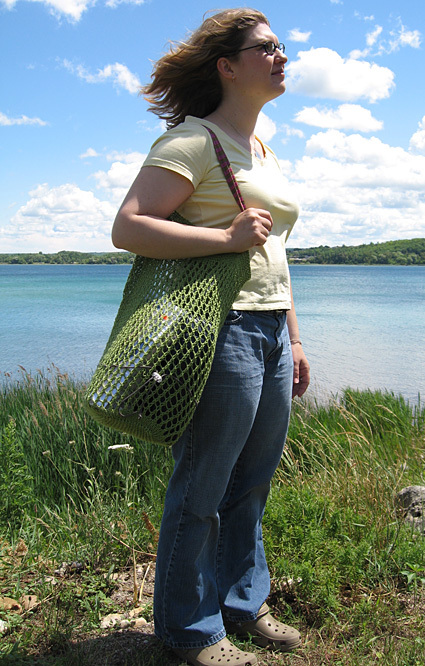 The mesh stitch lets it expand almost infinitely, but keeps the bag as light as it can possibly be. And it folds up into itself and can be tucked your purse or backpack, so you're never without it. For the handles, I decided to use affordable and sturdy twill tape that would hold its shape and not be a barrier to getting the bag done in my lifetime. [I don't have a stash of vintage ribbon to dig through.] But when I got to the shop, I found a perfect match with the fuschia/green chenille ribbon shown here, and I couldn't resist. Ordering information is below if you want what I got. Note: Mokuba offers mail order service. 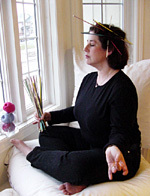 Read finishing instructions before purchasing ribbon. Note: gauge is extremely relative here because the stitch is designed to expand. Don't sweat it. With smaller needles, cast on 44 sts. Work in garter stitch until piece is 3.5" tall, ending after a WS row. Now turn the corner, and start picking up stitches along the short side of the bottom [14 sts], turn the corner again and pick up 44 sts from the remaining long side of the bag, turn the final corner and pick up the last short side's sts [14 sts]. 116 sts total. Place marker to denote beginning of round and k next 5 rounds. Chg to US 10.5 needles and k 1 round. Round 1: [yo, k2tog] repeat to end of row. Repeat rounds 1 and 2 until bag measures approximately 10" from base when laid flat, unstretched, ending with round 2. 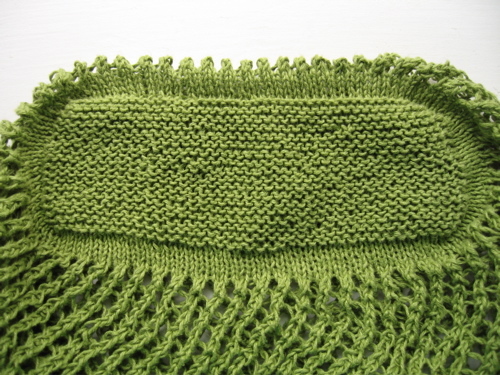 Change back to US 5 needles and begin working in garter stitch in the round. Work 10 rounds. 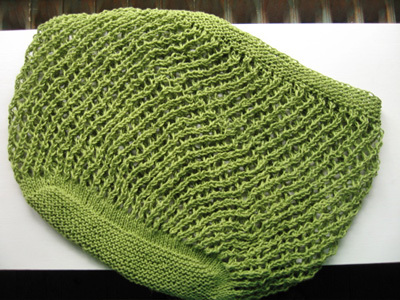 Use a very stretchy bind off like Lucy Neatby's Modified Conventional bind off [see Lucy's Knitting Essentials DVD volume 1 for a detailed how-to], or bind off on needles a few sizes larger. Weave in ends securely using a sharp-pointed needle, backstitching several times so that the stitches will not come undone. Note: for the ribbon handles, I used enough so that I could put the bag over my shoulder. The bag, when full, will hang quite low, so if you will only be carrying it in your hand, make the straps much shorter. Cut the ribbon into two pieces. Fold under 3/4" of one edge of ribbon and pin it to the inside of the bag, about an inch in from the edge, with the raw edge of the ribbon facing the inside of the bag. Do the same with the opposite end of the same piece of ribbon on the other side of the bag. Note: I ran the ribbon from the front to the back on each side so the bag would hang tidier when in use. 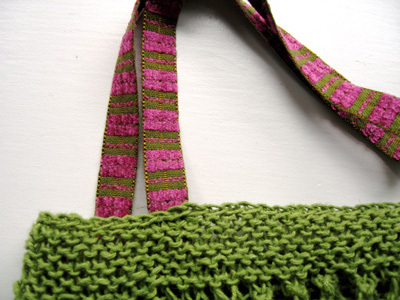 Split a piece of hemp yarn into sets of plies to provide perfectly colormatched sewing thread. 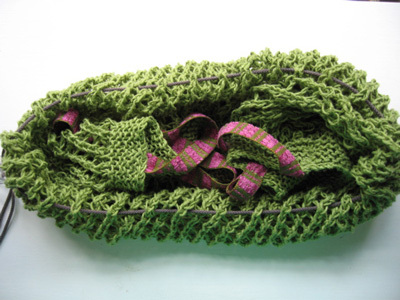 Take two plies of yarn, thread the sharp sewing needle and sew each side of the first handle securely to the bag. Do the same with the second handle. Take a large darning needle and thread one end of the drawstring through it. Attach the toggle to the other end of the drawstring and tie a loose knot. 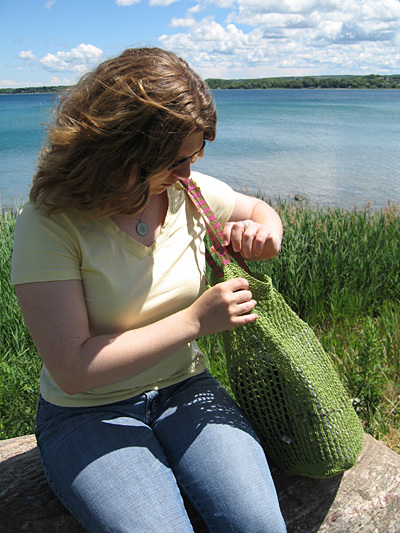 About a hand's width up from the bottom of the bag, begin threading the darning needle through holes in the mesh, keeping the drawstring horizontal. Work the drawstring back around to your starting point. 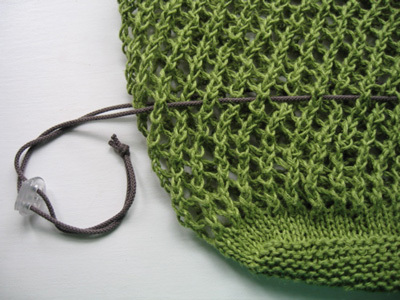 Remove the darning needle and thread the last part of the drawstring through the toggle. When you're satisfied with the position of the drawstring, untie the loose single knot and tie a strong double knot, making sure to leave enough drawstring so that the bag can be fully filled without being constricted. Trim ends. To stow the bag, tuck the handles and the top of the bag below the drawstring. Pull the drawstring tight. Amy is a bag ho™, but not for plastic. Pattern & images © 2007 Amy R Singer.